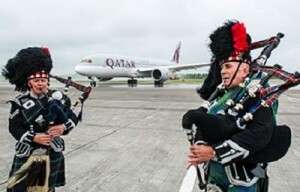 Qatar Airways, the award-winning five-star airline, has today commenced services between Edinburgh and Doha. The inaugural flight, which landed into Edinburgh International Airport at 13:15 today, was welcomed with a traditional water cannon salute, the classic sound of Scottish bagpipes and a gathering crowd within the airport terminal. This new Scottish addition to the Qatar Airways route map is the airline’s 141st global destination and will significantly reduce journey times for those travelling from Edinburgh to locations around the world. With smooth and frequent connection times in Doha’s brand new Hamad International Airport, passengers flying from Edinburgh will now be able to arrive at their final destination, whether it be Doha in the Middle East or further afield, without the need for any domestic transfers within the UK. The most popular destinations for those using the new route are likely to be in Asia and Australasia, with journey times to Melbourne reduced from approximately 26 hours with two transfers, to just 20 hours with one quick international transfer. Hamad International Airport, to which Qatar Airways moved all of its operations just yesterday, is the world’s newest airport and offers passengers an unrivalled travel experience. Hamad International Airport is the world’s latest global gateway and will raise the bar on passenger expectations, thanks to its state-of-the-art facilities and passenger focused design. Designed to accommodate 30 million passengers annually, rising to 50 million upon full completion, the airport covers an area of 29 sq. kms and is 60% built on land reclaimed from the Gulf. The new Edinburgh route is not only the first for the city to the Middle East region, but will also be Edinburgh’s first scheduled service on one of the world’s newest aircraft, the Boeing 787 Dreamliner. Scottish Minister for External Affairs and International Development Humza Yousaf said: “Scotland and Qatar are both strong oil and gas producing countries and the relationship between our two countries has continued to strengthen over recent years. This service will help build on this important link and promote Scotland as a great place to do business. By removing the need for extra connecting flights, it will also make Scotland a more attractive destination for tourists.” Mike Cantlay, Chairman of ‘VisitScotland’ said: “Bringing a mix of leisure and business travellers from right across the globe, this new route, between Doha and Edinburgh, is an unbelievable opportunity to open up Scotland even further to our key long haul and emerging markets. “VisitScotland’s strategy is to develop Scotland’s air connectivity by partnering key global airlines. Qatar Airways is a member of the OneWorld alliance and this service will ease access for millions of members across the Middle East, Asia, Australia, and Africa. “Our analysis shows that this incredibly exciting new route will bring around 33 Million Pound in projected revenue in the first year and 86 Million Pound after three years. Indeed we anticipate that visitors from Qatar itself will be amongst our highest spending visitors. As Scotland welcomes the world in 2014 with Homecoming Scotland, the Glasgow 2014 Commonwealth Games and The Ryder Cup, there has never been a better time to visit this stunning country of ours and we cannot wait to welcome visitors from Qatar and beyond”. Prior to the launch of services, Qatar Airways Chief Executive Officer, Akbar Al Baker conducted a number of high-level meetings with the Scottish First Minister Alex Salmond and the Lord Provost during a visit to Edinburgh. Scotland and Qatar have strong business ties already and this new route is likely to develop such business and trade relationships even further. Edinburgh will be Qatar Airways third destination in the UK, preceded only by London in 1997 and Manchester in 2003. The airline currently operates six flights a day from London Heathrow non-stop to Doha, including the new ‘Business One’ all-business class A319. The airline also operates 10 flights per week from Manchester non-stop to Doha. Qatar Airways has seen rapid growth in just 17 years of operations, currently flying a modern fleet of 134 aircraft to 141 key business and leisure destinations across Europe, the Middle East, Africa, Asia Pacific and the Americas.